I’m not much of a dessert person, it’s not that I’m ideologically opposed to them (we all need a bit of sweetness in our lives) it’s just that I tend to over eat on the savoury course and can’t be bothered with sweets. I guess I’m not gastronomically balanced enough to fit dessert in. I grew up in a family where dessert was a standard feature of our dinner. They weren’t glamorous – usually it was something like banana custard or junket (does anyone even eat junket now?) They were so much part of our mealtime landscape that I often didn’t eat them because they were so boring – not banana custard again! When I was a kid overweight children were a rarity and childhood obesity unheard of. We ate full-fat dairy products, portion sizes were smaller, carbonated sugar drinks and fruit juices were for special occasions only and everyone seemed to eat dessert. Recently when my son started rummaging through the pantry after dinner and asking plaintively if there wasn’t something some thing chocolate-ty for dessert – my first thought was he should eat some fruit then I felt bad – the poor boy was dessert deprived. In the name of gastronomical balance I decided I needed to make him something chocolate-ty for dessert. As this was in the middle of a hot, sticky and humid February, all baked or steamed chocolate desserts were out of the question. I needed something cool and summery but with enough of chocolate punch to satisfy those summer time chocolate cravings. 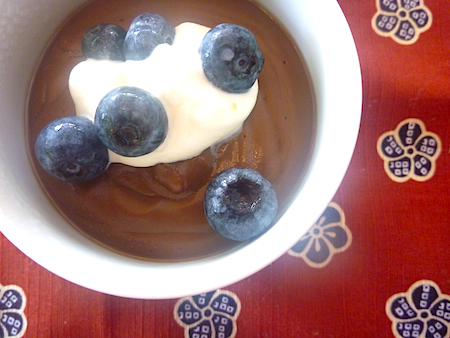 My first stop was the Smitten Kitchen blog where I tried John Scharffenberger’s silky chocolate pudding. While undoubtedly delicious it was not quite what I was looking for – it was too intense, too chocolate-ty. I wanted something slightly lighter with more of the wobbly, slightly jelly-like texture of an old fashioned blancmange. On Serious Eats I finally found the recipe that came close to my ideal – these puddings use slightly less solid chocolate and boost the chocolate flavor with cocoa and so keep the slight jelly-like wobble that every good milk pudding needs. 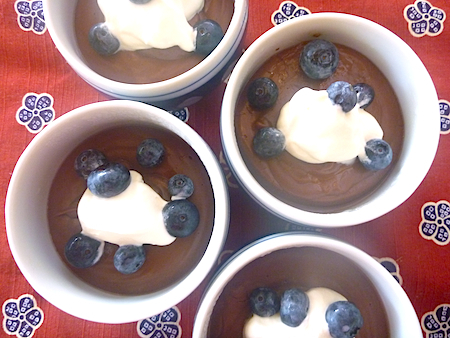 I’ve made these puddings a few times and while good quality chocolate does make a difference, I’ve also made them with some pretty ordinary cooking chocolate that I had hanging around in my fridge, and they were still delicious. 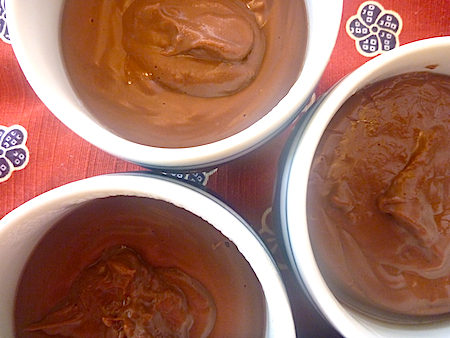 The thing I love most about these chocolate puddings is the wholesome simplicity of ingredient list – whole milk (low fat milk won’t cut it here) , cocoa, sugar, dark chocolate, vanilla essence and corn flour. There is no raw egg so pregnant women and young children can eat them (and even lick the saucepan). The method for making these puddings is no more difficult than putting together a packet mix. There are no mysterious numbered additives, so you know exactly what is going into them and in this day and age it probably makes these puddings almost a health food. Serve them with a dollop of organic cream and blueberries and they’re practically a super food. 1 ½ teaspoons pure vanilla. 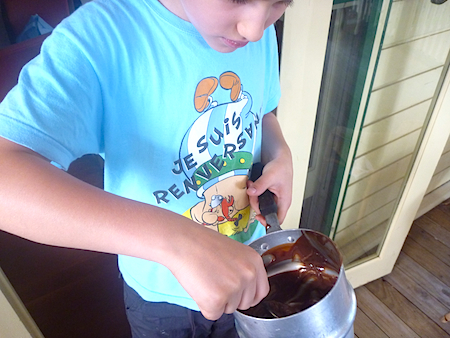 In saucepan of double boiler whisk together corn flour, sugar and cocoa powder. Gradually whisk in milk, then place over boiling water and whisk until mixture thickens. 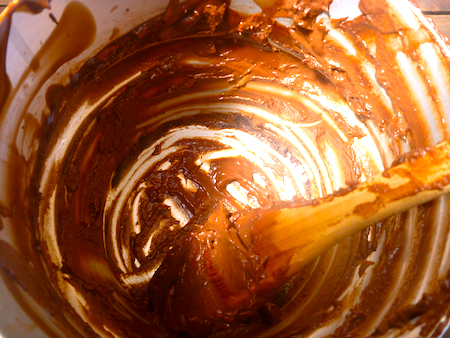 Keep whisking for about 5 minutes until mixture is thickened, add chocolate and keep stirring for another few minutes until chocolate has melted and mixture has thickened completely. Remove from heat add vanilla essence pour into one large bowl or six individual 150 ml pudding bowls. Cover with plastic wrap (to prevent skin from forming on the pudding) and refrigerate at least an hour before serving. The pudding will keep for about three days in the refrigerator. This is a very good chocolate pudding. I had about three servings of it (not at the same time – that’s a bit greedy) and just wanted to come back for more. Try with very whipped cream, so it’s almost the same viscosity (just love using the word ‘viscosity’) and becomes irresistable, even if you don’t really like chocolate puddings.